Serves… quite a few? Shoot, I don’t remember how many servings I got. 6? 8? 6-8? Line a rimmed baking sheet with aluminum foil. In an extra-large mixing bowl combine the carrots, 1 tablespoon olive oil, sugar, salt and pepper. Toss the carrots until evenly coated. Pour the carrots out onto the lined baking sheet and set in a cold oven on the lowest rack. Heat the oven to 425*F and roast the carrots for 30-40 minutes. Stir them occasionally to make sure they cook evenly. (But don’t stir too much; you want the bottoms to really caramelize on the hot baking sheet.) Remove from the oven and set aside. In a large Dutch oven or soup pot, heat the remaining 1 tablespoon olive oil over medium heat. Add the onion and saute until translucent, 5-10 minutes. Add the garlic and saute until very fragrant, another minute or two. Add the curry powder and stir for a minute until very fragrant. Add the carrots to the pot and stir to coat in the onion/garlic/curry mixture. Add the white wine and simmer for a minute. Add the vegetable broth and bring to a boil. Once boiling turn heat down to low, partially cover the pot, and simmer for 5-10 minutes. The carrots should be easily pierced with a fork. 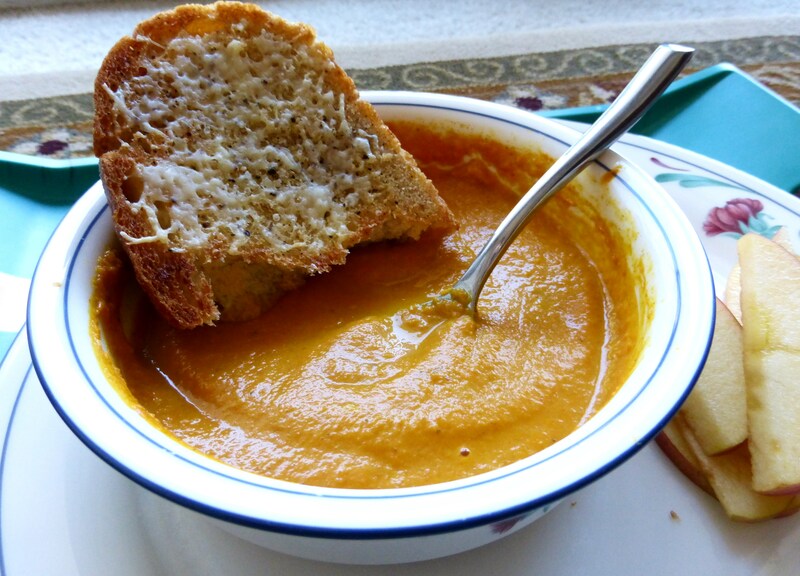 Using your immersion blender, puree the soup until very smooth. Add the evaporated milk and stir until fully incorporated. Thin with water if soup is too thick. Serve with cheese toast or the leftover croissants from the office breakfast tray. Shown is a half serving. Other half was already eaten! Yes, I ate this sitting on the floor. We’re casual around here. *The schtick of this book is that you mostly use formulas in the kitchen, not strict recipes. So, for example, in this recipe Pam suggests you use two pounds of any root vegetable or hard squash (or even cauliflower! ), and two tablespoons of any seasoning that you think would go with the vegetable. I think I’ll try butternut squash and maybe cinnamon and some cayenne next. **Preferably one you’ve used before, so you can tell if it’ll be spicy enough on its own. The carrots roast up rather sweet, but the medium heat (in my case, ha) of the curry powder plays against that sweetness nicely. Add cayenne or a few dashes of our favorite hot sauce at the end if it’s not spicy enough for ya. Girl, have you made mac-n-cheese from scratch? It’s way easier than I thought it would be. It’s a white roux, plus milk, plus cheese. Then you add some mustard and some other flavors. Add noodles. That’s it. Except of course I took it about four steps further, because I cannot leave anything alone. I added 8 ounces of frozen (thawed and squeezed dry) spinach to the sauce, which is something I will definitely repeat. I roasted acorn squash to serve as an edible bowl, which was tasty, though the texture between the roasted squash and the noodles was a little too similar. I mixed Parmesan and panko breadcrumbs together and added them in the last 10 minutes of baking to the top of the whole mess. That was a good choice their crunch added much needed texture to the dish. Best part, though? I made this at Cooper’s, and at the last minute we added some of this garlic-y bread dipping seasoning she had in her pantry (not that exact brand, but similar). It made it, just amped up the flavor tenfold. I’d never had split-pea soup before, Kaki. But Elissa Altman mentioned it in her memoir as a really tasty and yet, er, cost-effective recipe, so obviously I had to try it. I’m really glad I did, this soup is tasty. But a couple of notes: this soup is mostly about the ham. Great flavor, but it’d be hard to de-meat this particular recipe. Also, it was really not that tasty just after I finished making it, but the next day it was way, way tastier. I’m used to soups tasting better after a day or so, but this was a drastic improvement. Tasty. Really tasty. The dough had a ton of molasses flavor, almost too much, but it mellowed a lot after baking. Even so, these were just shy of what I was looking for. I’m going to try this Drunken Molasses Ginger Cookie recipe next and see if it has that elusive, “This is it!” quality I’m looking for.